Dr. Chris Cantwell is a computational engineer and Research Fellow in the Department of Aeronautics at Imperial College London, United Kingdom. Dr. Cantwell received an MMath in Mathematics in 2005 and an MSc in Scientific Computing in 2006, from the University of Warwick. He received a PhD in Scientific Computing in 2009, also from the University of Warwick, investigating the stability and transient growth of perturbations in fluid flow. He moved to Imperial College London to join Professor Spencer Sherwin’s group, developing high-order spectral/hp element methods, followed by a discipline-hop award from the British Heart Foundation in order to engage with applications in the field of cardiac electrophysiology. 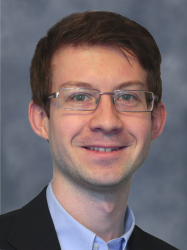 Dr. Chris Cantwell’s research is centred around developing novel and scalable numerical approaches for efficiently modelling and understanding complex physical processes in the aerodynamics and biomedical domains. Much of his work to date has focused on the efficient implementation and application of spectral/hp element methods for performing high-fidelity numerical simulation and making these tools more accessible to users without a detailed understanding of the numerical methods. However, driven by applications in biomedicine, his research interests now include the fusion of numerical modelling with statistical methods and machine learning. He is a strong proponent of open-source software and is a project leader of the Nektar++ spectral/hp element framework which acts as a vehicle for much of his research. Dr. Chris Cantwell is a member of the Imperial College Centre for Cardiac Engineering where he combines numerical modelling and signal processing with clinical data, medical imaging and basic laboratory science within the ElectroCardioMaths programme. Interests include techniques for the integration of patient data into personalised computer models; identifying and understanding pathological conditions for the perpetuation of atrial arrhythmias; and developing novel approaches to improve patient care. He works closely with clinicians and basic scientists in the Cardiology department at Hammersmith hospital and the Imperial Centre for Translational and Experimental Medicine. He has developed high-order spectral/hp element software for modelling electrical activity in the left atrium using the Nektar++ spectral/hp element library. This has the potential to allow rapid patient-specific simulation to be performed on clinically tractable timescales. Further information on his research and publications is available.